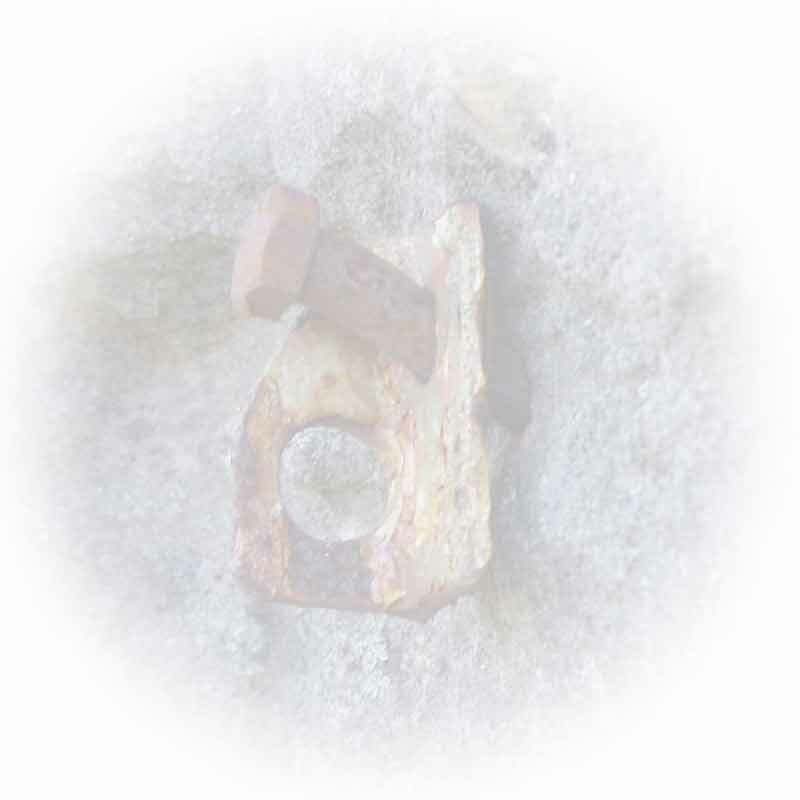 Depending on the rock type, rock angle and crag ethics there are many variations of safe bolts and anchors that can be used. When rebolting routes the anchors installed must be designed to withstand repeated and heavy use for fifty years or more. Many of the old carrot bolts out there have been used for over thirty years already! Cost should not be a decisive factor if you want to place bolts. The need to cut costs creates routes that are shoddily bolted with unsafe gear. As a general rule a five bolt sport route with an anchor will cost more than $50. If you cannot afford to pay this amount then do not even consider bolting routes in Australia. It is important to leave behind a quality job when rebolting. Spend the time and invest in tools to remove the old bolts cleanly. The aim is to extract the old bolt and reuse the hole for the new bolt. A big crowbar or a 'carrot killer' device can remove bash-ins with ease. A funkness device (hammer with chain of quickdraws) can also extract problem bolts. If all else fails and you cannot remove it cleanly then use a socket wrench with a big handle and twist the head of the carrot off below the surface of the rock. Do not use a chisel to 'chop' the bolt off. 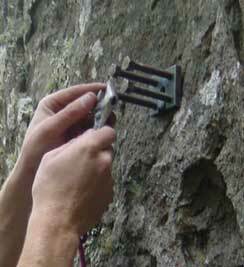 This creates ugly exposed studs which can injure climbers who fall on them. Carrot Killer device. Wrench with bar to 'twist' off the head of a bolt. 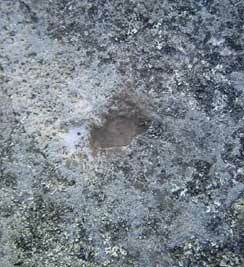 Patch and conceal with dirt all old holes and bolt scars. Epoxy putty is good for this job when mixed with gravel from the base of the route. If you cannot reuse the old bolt hole then place the new bolt at minimum 100mm from the old hole. Bolts should be replaced on a bolt for bolt basis. Extra bolts should not be added unless you have permission from the first ascensionists and the general climbing community. It is not your right to change the climb to make it better, safer or more user friendly. A group discussion on this forum will tell you if your ideas are the same as the general community. In highly public areas (i.e. Camels Hump, Kangaroo Point & Werribee Gorge) bolts should be camouflaged with paint and glue embedded with local dirt around the entrance of the hole. 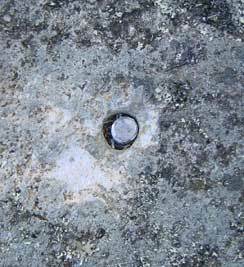 Ring bolts can be almost invisible if recessed properly. When recessing, ensure not to go so far as to create "biner-bind" where the carabiner cannot move freely. This could snap a carabiner. An very obvious and ugly example of an unrecessed ringbolt. The messy glue from a capsule (also bad) is an eyesore. 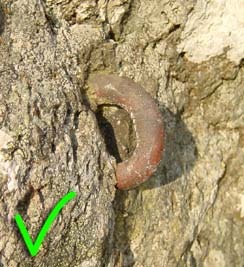 A camouflaged ringbolt that is well recessed. A mix of epoxy, metal paint and dirt was used to texture the outside of the bolt and the glue notch. Do this where visual impact may be an issue. Any anchor that may get high use as a lower off (rap chain) must be designed to be replaced easily when it wears through. 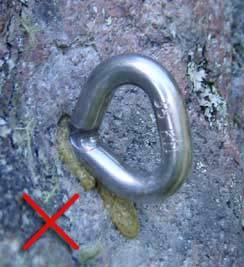 Rap bolt anchors should not be added to climbs that did not have them originally unless it is to replace a sling, tree, piton or other unsafe anchor setup. Read our 2016 update on best practice guidelines for lower-off's! Please try and avoid top-roping directly through anchors. 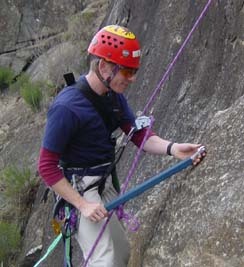 If you have to do so, run your ropes through your own carabiners  not directly through the anchor. This will stop the anchor wearing out prematurely. Only the last person should lower through the anchor directly.